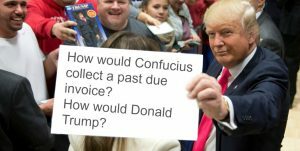 How Would Confucius Collect a Past Due Invoice? This is from the book in development, “How Would Confucius Collect a Past Due Invoice? How Would Donald Trump?” For more information, click here. First and most importantly, Confucius would rejoice. He might even do his ‘happy dance’. Why? Because he would be involved in a situation where he and his firm may want something that TOS (the other side) does not want to give. The long-term objective will be to get TOS (The Other Side) to ‘come around’, to your way of thinking and to your side of the table. When you are successful, it becomes their idea to pay – you just get out of the way. Gather information, both facts and opinions. Review the agreements, details and who approved within their organization. How have they paid you in the past? When did the payment pattern change? How do they pay their other suppliers now and what has changed? Has anything changed within your organization and how you invoice and follow up for payments? What about your sales team? Check them not only for information, but for recommendations. How about the economy and changes in the market – for them and for their clients? When, and only when, you have gathered information, set up a discussion/meeting with your client. You are still in the fact-finding phase and your objective is to listen with an open mind. Confucius would spend whatever time is needed to let the client know there is a situation that the two of you will be hoping to resolve. The client is becoming a member of the committee tasked with the objective of resolving the past due invoice. You are not making demands at this point, but asking for their help. They may propose a repayment plan that is acceptable, but you should be prepared with one of your own. It should reflect the ability of the firm, be achievable, and naturally enough, with fast results. Some flexibility may be called on your part. While you prefer the more ambitious repayment plan, you prefer one less so, if it will include commitment by your client. Once they have agreed, better yet, they have proposed, and you have agreed, document and send by letter or email. Ensure that you follow up with reminders as well as thanks, where and when appropriate. Confucius, as Carol reminds us in her book, says that the person who is brusque in their movements will not obtain co-operation and if they ask for something without first establishing relations, it will not be given. So, how would Confucius collect a past due invoice? He would become the ‘partner’ who clients want to pay. "I have operated in this field for more than 12 years thru many accreditation courses, workshops and sessions…I found it rare to see someone within your caliber in terms of professionalism and dedication." "As a Gold Advanced Toastmaster, I can't help myself - I am very picky about speakers – always conducting my own evaluation. Mr. Paulsen was fantastic. He was relaxed, exhibited great timing and demonstrated a wonderful way to get a message across to us. It was Impressive! "No excuses! The right training and the right tools and you can eliminate all excuses for being the best you can be, doing the very best you can do. No excuses." "You delivered a very dynamic, comprehensive collection-specific seminar. Our team continues to use the many techniques provided in your presentation. Your program was a real win for our collection team!" Learning about collections is sometimes as misunderstood as collecting itself. Tim Paulsen's approach leaves the learners motivated and confidant, two essential elements to making effective collections."